Ninety years ago, Pan Am World Airways flew its first flight, delivering mail between Florida and Cuba. For nearly 30 years, the carrier called New York City home, with its name and familiar globe logo adorning the Manhattan skyline until it went out of business in 1991. The airline left a legacy of firsts. "It was first across the Atlantic, first with flights across the Pacific and the first to offer around-the-world service," said Kelly Cusack, the curator of the Pan Am Museum Foundation. 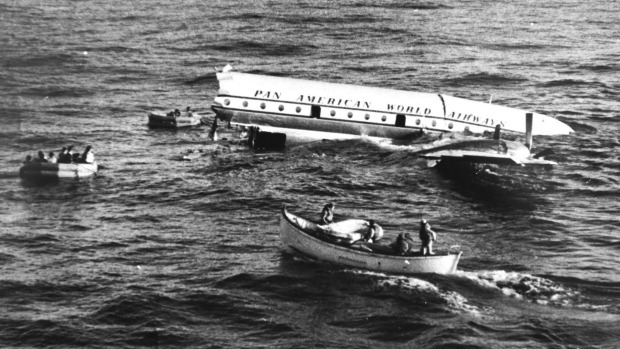 On Saturday, a different kind of first will be remembered at the Cradle of Aviation Museum in Garden City, Long Island, when the Pan Am Foundation honours the crew of what officials there said was the first airliner to ditch in the ocean with no fatalities. The Pan Am flight took place six decades ago - 53 years before Capt. Chesley B. Sullenberger III and Jeff Skiles made their famous emergency landing on the Hudson - and the entire nail-biting event was captured on camera. "This is a particularly memorable and a proud part of our legacy because of two words: happy ending," said Jeff Kriendler, who was Pan Am's vice president for corporate communications in the 1980s and has written several anthologies about the airline. In 1956, on a nighttime flight from Honolulu to San Francisco, a Boeing 377 Stratocruiser developed engine trouble in one and then two of its four engines. Pan Am Flight 6 was about halfway across the Pacific Ocean at the time and the malfunctioning engine propeller sent the airplane into a descent. The decision to land the plane in the sea with 24 passengers and seven crew members aboard was not made in haste. Captain Richard Ogg, the pilot, wrote an account of the episode a year after it happened. He had to weigh many factors. Should he jettison fuel and try to land on the water immediately or fly until daylight provided better visibility? One thing was clear, the bad propeller was causing the plane to burn fuel too fast. He would not make it to San Francisco or Honolulu. Ogg, who died in 1991, was in radio contact with Coast Guard Capt. William Earle, who was commanding the Pontchartrain, a 77-metre cutter sailing below the plane. It was no coincidence that the ship was nearby. 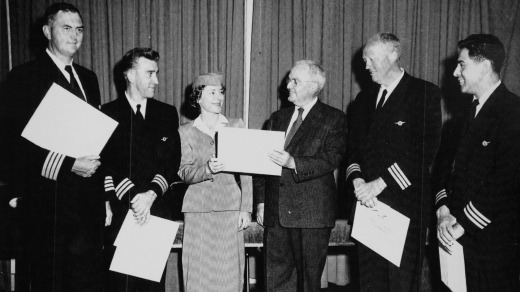 In the early days of long flights over water, Coast Guard ships were positioned in the Pacific and the Atlantic Oceans, offering weather information to flight crews and relaying radio messages, according to Doak Walker, a Coast Guard historian who participated in the rescue of Flight 6. The cutters were placed near what was referred to as the point of no return, the area where a plane would have burned so much fuel that it would not have enough to turn back in case of an emergency. Ogg opted to fly an eight-mile circuit above the Pontchartrain until morning while planning for the water landing. Remembering that during another Pan Am Stratocruiser ditching, the tail had broken off, Ogg had the passengers in the back of the plane move forward and asked those seated by the engine to move as well. "We will try to stay aloft until daylight," Ogg radioed to the Pontchartrain. When the passengers learned the flight would circle and not attempt to land in the dark, "it gave them a lot of confidence," said Frank Garcia, 91, the flight engineer and a guest of honour at the Pan Am event. Passengers were also comforted knowing "someone was out there waiting to give them as much aid as they can," Garcia said. 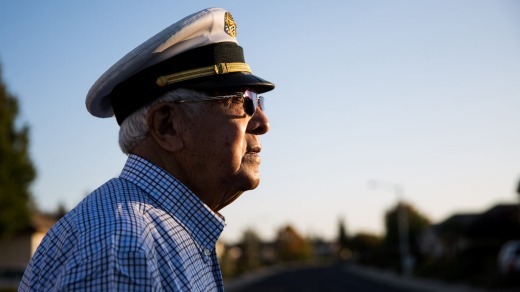 Standing watch on the cutter just after 8 a.m., Walker, 83, recalled that "the seas were extremely calm and the weather was good and we were hoping there wouldn't be much of a problem." As Ogg had anticipated, as soon as the plane hit the sea, the back end broke off. 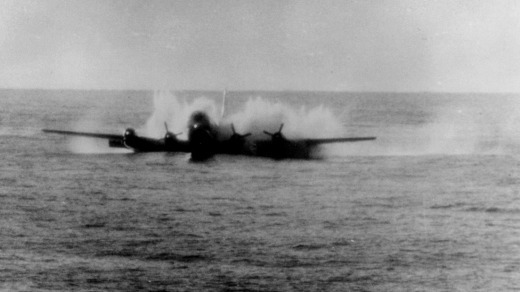 Then the nose of the airliner went under the water. "I felt as if somebody had grabbed the seat of my pants and was pulling," Garcia said. "I saw the water. I was more frightened if the windows broke, then the water would come in." From the cockpit, all Garcia saw was water. "I can't tell you how many seconds, it was less than a minute, and I saw the water receding," Garcia said, as the front of plane surfaced. On the Pontchartrain many thought they had just witnessed a disaster, Walker said. "It was so sad," he said. "We knew nobody could survive that." Rescue boats sped toward the plane, while other Coast Guardsmen filmed the event. Captured moments included life rafts bobbing by the aircraft's fuselage, transferring survivors to rescue boats, the sinking plane, and the lifting of twin toddlers, Maureen and Elizabeth Gordon, from a lifeboat into waiting seamen's arms. And, everyone was saved. "It's a tricky thing to celebrate a mishap, although what an incredible story that everyone walked away," said John Hill, the curator at the SFO Museum at San Francisco International Airport, where Pan Am also had a large presence. "You have to unpack what happened. There were procedures. There were plans. There was an additional layer of support." When aircraft disappear, more than two-thirds of the time they are flying over water, said James Stabile, the vice president of Aeronautical Data Systems, which developed a program that lets pilots know what ships are below them. And in the handful of cases in which an airliner landed in the water and no one died - like Flight 6 and US Airways Flight 1549 in the Hudson in 2009 - boats were on the scene immediately, Stabile said. The 10-minute Coast Guard film about Flight 6, complete with the radio conversation between the ship and the plane, is dramatic enough to compete with the "Miracle on the Hudson." Beyond compelling viewing, though, the Flight 6 story is a reminder that it was not just early aviators who were pioneers - the passengers were, too. "The pilots were the ones who had some semblance of control, the passengers did not," said Linda Shiner, editor of Air & Space magazine. Just getting on an airplane in those early years was courageous because aviation was not as safe as it is today, Shiner said. And when something catastrophic happened, the industry tried to learn from it. "Because passengers took those risks," she said, "we all travel a lot more safely now."